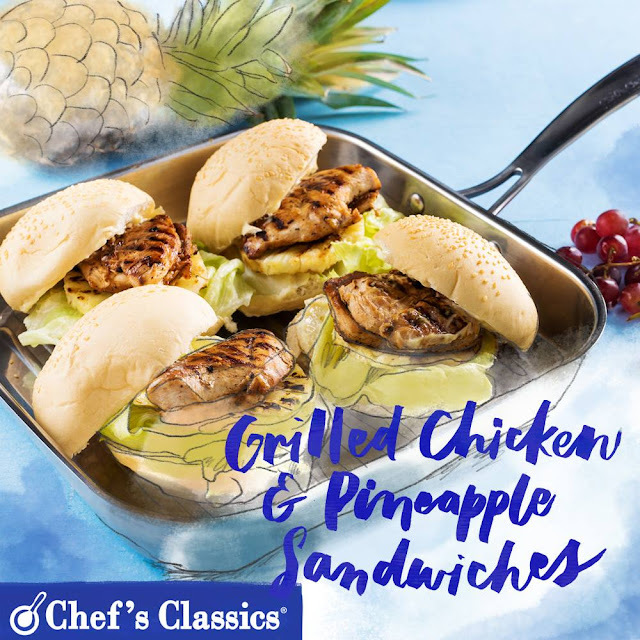 Whether you're abstaining from red meat or choosing to eat healthier, this grilled chicken and pineapple sandwiches are for you. Flavor and texture need not to be sacrificed! 1. Heat the Chefs Classics Fennel Grill Pan and brush with olive oil. Grill the chicken breast. Sprinkle the chicken evenly with salt and pepper. Grill for about 5 to 6 minutes on each side or until done while brushing occasionally with lime juice. Set aside. 2. Grill the pineapple for 2 to 3 minutes on each sides or until browned. Set aside. 3. Spread mayonnaise on bottom halves of buns. Top each with 1 chicken breast, 1 pineapple slice, 1 iceberg lettuce and 1 bun top.